ROYAUME UNI – Londres - Work to improve London Bridge station as part of the Thameslink upgrade is giving archaeologists their first access to this important historical site since the Victorians carved it up with railways around 150 years ago. Substantial Roman remains, as well as foundations and objects from the Saxon and Medieval times, have recently been uncovered, reports SE1 website. Besides the station dig, the area has recently seen extensive mud-shovelling to build The Shard and The Place, as well as reworking bridges and buildings around Borough Market. 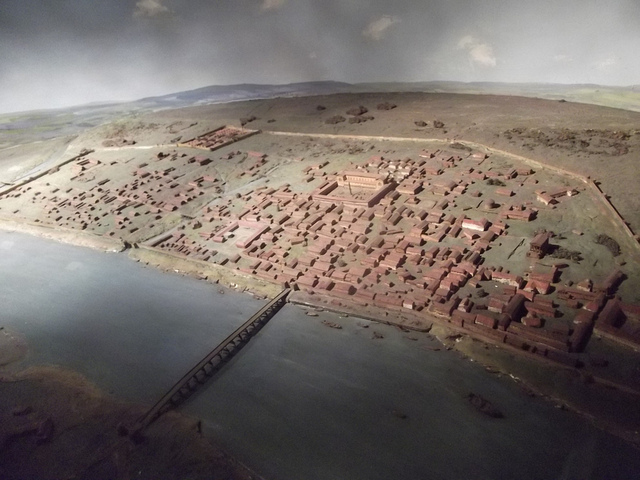 The turmoil is yielding a steady stream of discoveries on this most ancient part of London, settled by the Romans at the same time as Londonium across the Thames. Perhaps the biggest find is the remains of one of the earliest buildings known in Southwark. 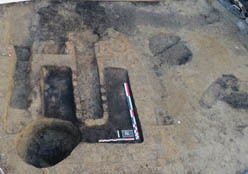 A pit near Joiner Street has yielded 17 timber piles, part of a structure from the first century AD. Little is known about this eastern edge of Southwark in Roman times, and these are exciting times for excavators. Two years ago, a Roman baths was found on Borough High Street. Most discoveries will go to the Museum of London. As part of planning consent, a display area of artefacts will also be constructed in the new London Bridge station. ROYAUME UNI – North Ferriby - A team of history experts and boatbuilding volunteers will be praying to the prehistoric gods for good weather this week, when a recreation of a 4,000-year-old boat – constructed without nails and sewn together using yew withies – will be launched from Falmouth Harbour in Cornwall. First made in around 2300 BC, sewn-plank boats were unique to the British Isles, connecting metal traders and social networks across Britain, Europe and Ireland. 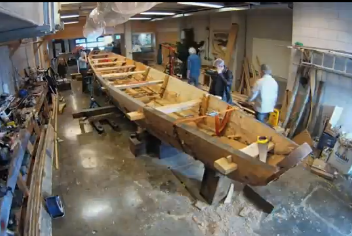 Basing their boat on an example found in North Ferriby, on the Humber, the team has shaped this modern version with the methods and tools of the time, using Bronze Age axeheads and two huge oak logs to create a 50-foot long, five-tonne vessel. “The launch really is the moment of truth for this project,” says Professor Robert Van de Noort, from the University of Exeter, who has overseen the labour of long-forgotten love with the help of collaborators from the University of Southampton, Oxford Brookes University and the National Maritime Museum Cornwall. The launch is expected to take place on March 6 2013. FRANCE – Strasbourg / Argentorate - La fouille a lieu actuellement dans l’emprise des Hôpitaux civils de Strasbourg. Elle a démarré en août 2012 suite à un projet de construction mené par la CUS. Réalisée sur une emprise d’environ 3850 m², elle a permis de confirmer les plans des états antérieurs de l’hôpital (XVIIIe-XIXe s.), de montrer une occupation ténue de ce secteur entre les XIVe et XVe s., et d’apporter de précieuses connaissances sur l’occupation gallo-romaine dans ce secteur de la ville, qui n’était jusqu’alors pas connu. La fouille a ainsi permis de mettre en évidence au moins 3 états d’occupation, répartis entre le dernier tiers du Ier siècle et la première moitié du IIIe s. apr. J.-C. On notera plus particulièrement un habitat lié au camp de la VIIIe légion Auguste, ainsi qu’un petit secteur artisanal. Les habitations se présentent sous la forme de longs baraquements de plus de 20 m de long, montés sur sablières avec poteaux, parois de torchis et murs en adobe, auxquels étaient associés des puits et foyers. Le secteur artisanal est quant à lui marqué par une structure de chauffe, sans doute un fumoir ou séchoir, réalisé en brique crue et qui était alimenté par trois foyers circulaires. Ce type de structure reste rare : les exemples généralement connus sont réalisés en pierre et non pas en matériaux crus. MYANMAR – Mrauk U - Myauk U, also known as Mrauk U, the old city of Rakhine State is supposed to reopen its doors to visitors soon, the Deputy Minister of Hotels and Tourism Tin Shwe said at the Lower House on February 21. 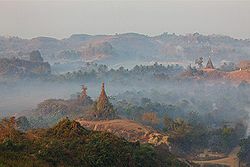 Myauk U is expressed as the Ancient Arakan King’s Capital and the cultural heritage zone in Myanmar, comprising thousands of Buddha stupas, temples and pagodas. According to Tin Shwe, Myauk U has been regarded as the tourist destination. Unfortunately, it was temporarily closed once from August 30 to September 25, 2012 due to the crisis and closed again in late 2012 for the next time crisis in the region. GRECE – Kavrochori - A tomb of the Geometric Era has come to light in Kavrochori, a village near Heraklion of Crete, belonging to the Malevisi Municipality, during works for the construction of a biological cleaning unit. 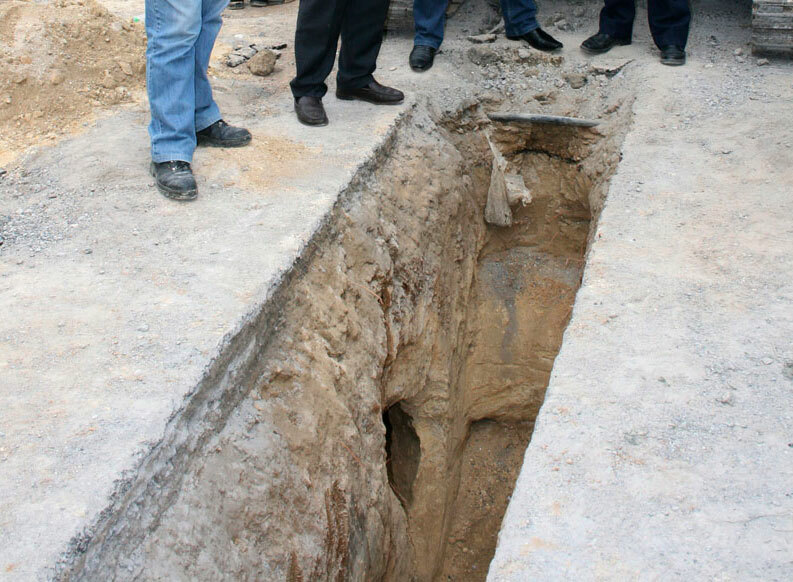 More precisely, during the cutting of the last part of the pipes for the network of the unit, the excavators revealed a small cavity, which turned out to be an ancient tomb. The archaeologist in charge, A. Lyrintzis stopped the excavators and notified the 23rd Ephorate of Prehistoric and Classical Antiquities.The tomb, which is estimated to date back to the 9th century BC, belongs to the group burial category. More than 10 pots were found within the tomb, many of which contained skeletal remains. The most significant finds were a cinerary urn and an exquisite oinochoe. PAKISTAN – Mansehra - The archaeologists working on the Higher Education Commission (HEC)-funded survey in Mansehra district have identified 30 new locations where the remains of the Buddhist era were traced for the purpose of further research. The newly-explored sites include the Buddhist era stupas in round and square shapes discovered in damaged condition, besides the Gandhara style graveyard at various locations.Dr Zainul Wahab, an archaeologist working on the survey of the archaeological sites in Mansehra, said the spots identified and outlined in the survey were full of information about the Buddhist civilisation. He added that further research might unearth a complete Buddhist complex in the area as the region is rich in the remains of the ancient Gandhara culture.He said the sites they had worked on could be compared with similar ruins in its display and uniqueness in other parts of Khyber Pakhtunkhwa. He added that they had worked on some newly identified sites in Chatter Kot and Javed Khan areas in the Oghi tehsil of the district.He expressed the hope that they would launch joint research work on the newly mapped archaeological sites .